This rather unusual salad is one of those dishes that comes together quite naturally in the early fall. The first frost has not yet arrived and while nights are cool, the days are still sunny and warm. Colder weather is just around the corner though. Days are growing shorter and backyard gardens are winding down, yielding the last few sweet, sun-ripened peppers of the season. But while tame, cultivated crops are ending, wild mushrooms are exuberantly bursting forth from the leafy floors of the forest. When one season is ending, another is just beginning. 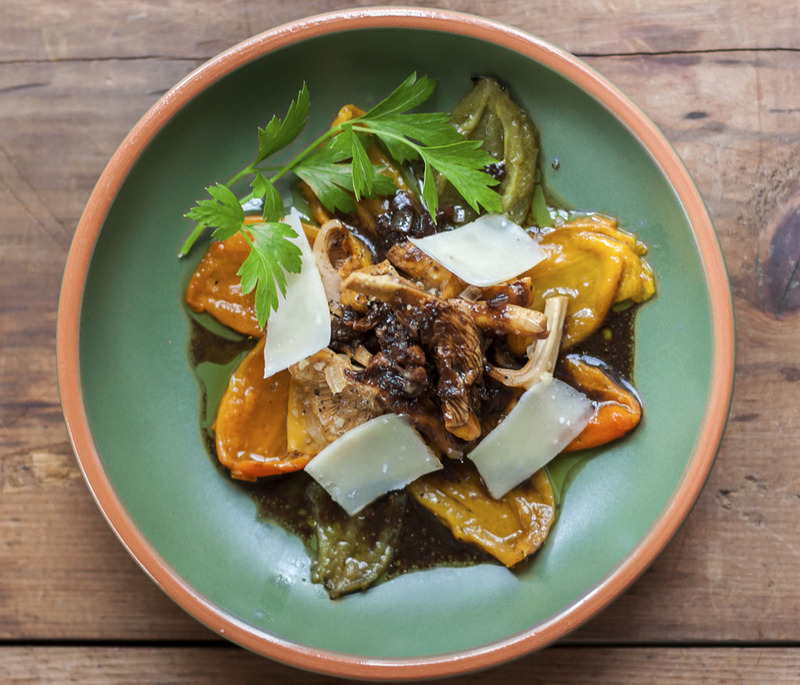 Wild-growing mushrooms and cultivated peppers may not be the first fall pairing that springs to mind, but their individual flavors complement each other in remarkable ways. When peppers are grilled, their skins quickly blister and char, leaving behind sweet, tender flesh with notes of ripe fruit and rich smokiness, that echo the scent of burning fall leaves. 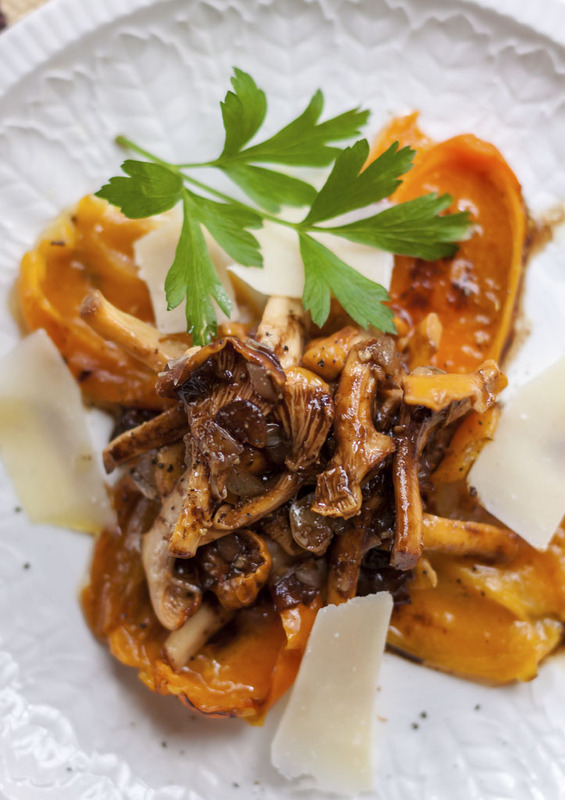 Wild mushrooms, especially flavorful, fruity chanterelles, make exceptionally fine companions to smoky-sweet grilled peppers. Drizzle with a savory mixture of balsamic vinegar, olive oil and mushroom pan juices and there you have it – the perfect union of field & forest. 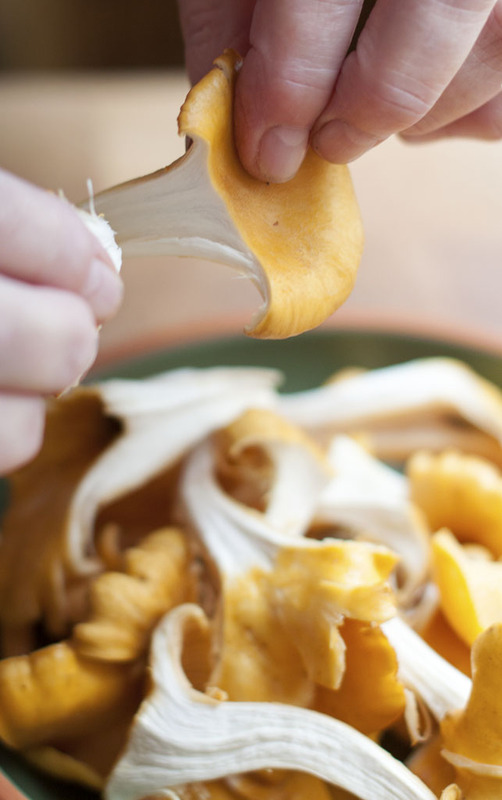 Fresh chanterelles or a mixture of wild mushrooms are ideal for this salad. If wild types are out of season, try a combination of flavorful cultivated mushrooms, such as hen of the woods, trumpet royale or brown clamshell. Any fresh pepper can be used in this dish, from sweet & mild to fiery hot. We used a mixture of sweet peppers, but added a few moderately spicy peppers for interest. The flavors were spectacular and the occasional burst of heat was surprisingly enjoyable. Clean the mushrooms by brushing away dirt and forest debris. If especially dirty, rinse quickly under cool running water and pat dry. Cut or tear them into pieces, leaving some of the smaller mushrooms whole. Preheat a grill to high, brush it clean, oil the grate well, then reduce the flame to medium. Toss the peppers with 2 tablespoons olive oil to coat. Lay the peppers out on the grill, turning them frequently, until the skin is evenly blistered and charred, about 10 minutes. Remove the peppers from the grill. To peel or not to peel: depending on the peppers (and your personal preferences), it may be desirable to remove the skins after roasting. If you DO decide to peel the peppers, go to the next step. If not, skip it. Note: whenever cooking with hot peppers, be careful not to touch any sensitive areas after handling or cleaning them. Disposable gloves are always a good idea! 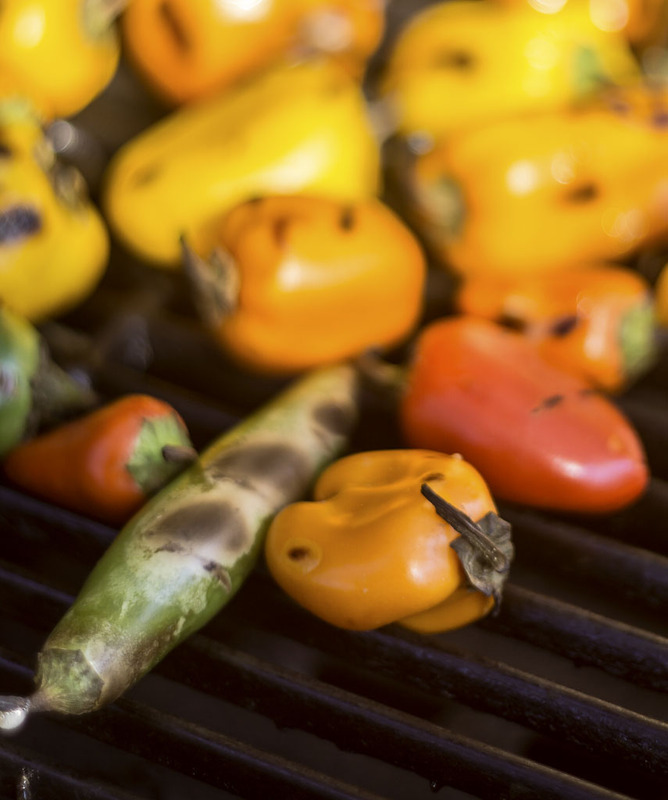 If peeling the peppers, transfer them directly from the grill into a plastic resealable bag. Close tightly and let them “sweat” for 10-15 minutes. Remove the peppers from the bag one at a time and peel off the skin with your fingers or a knife. Discard the skins and set the peppers aside. Pull off the stems and slit each pepper to remove the seeds. Cut the peppers into large pieces and arrange them on individual serving plates. Set aside momentarily. In a frying pan, heat the remaining 2 tablespoons of olive oil to medium low. Add the shallots and garlic and cook, stirring frequently, for 2 or 3 minutes or until translucent. Add the mushrooms and raise the heat to medium high. Continue to cook until they have released their liquid and are tender, about 5 – 7 minutes. Using a slotted spoon, remove the mushrooms from the pan and arrange them over the peppers, leaving the accumulated juices behind. Add the vinegar and mustard to the mushroom pan juices; raise the heat to high and simmer until the liquid has reduced to 2 tablespoons. Season with a dash of salt and pepper, then drizzle over the peppers and mushrooms. Let stand for at least 30 minutes to allow all the flavors to mingle. Before serving, taste and add more salt & pepper if desired. Top with the cheese shavings and garnish with sprigs of fresh parsley.